Left Coast Rebel: America is Great Because…. I do books and consulting for over 30 small businesses, and I can say one thing, they may all not done it on their own, but none, and I mean NONE, ever succeeded with help from the government. If anything, all they get are disincentives. Fair share? They take more than any entity in their business operations. I wish Politicians stop thinking they're reason why businesses are able to succeed when they do far more damaged towards making them fail. 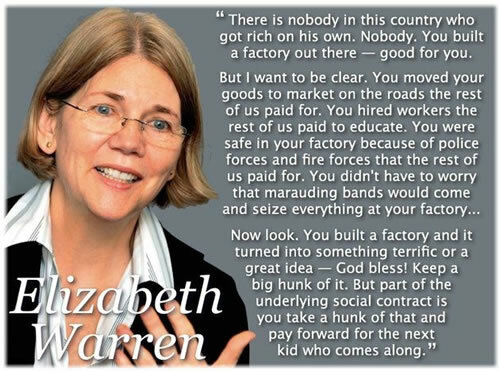 "...made it as far as Elizabeth Warren without either affirmative action or sleeping their way to the top." Ouch. Nicely said, sir. Nicely said.